I was browsing though my photo collection today morning, and stumbled upon the amazing photo folder of Bedse Caves. In that, there was this amazingly beautifully carved natural thing — leaf veins. While climbing the steps of the Bedse Caves, there are small shrubs on both the sides, of a variety of species. One was very dry in them as if it had some infection. 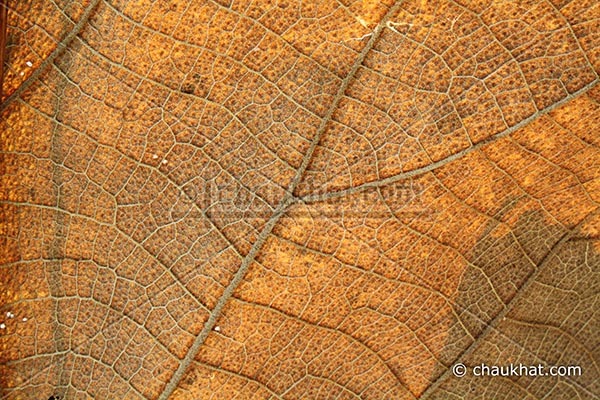 Sounds ugly, but this is the photo it produced, the photo of leaf veins; see below. I have named it leaf veins. I had published a similar photo about 2 years back, but it was a green one. You may want to see it at Leaf Structure. I hope you liked this photo of leaf veins. I think I like the green leaf better. It kind of reminds me of things I've seen under a microscope. I think I worry that my skin is going to look this way in a few more years, no matter how much moisturizer I use. I think Indian skin fares better aging than Caucasian skin does. Somehow, I think Ashaiwara Rai is never going to have wrinkles! @ RNSANE: I too believe the same! This looks interesting, especially the color.